These gingerbread cupcakes with marshmallow frosting and pomegranate caramel might be some of the best baked goods I’ve ever made. And I take that statement very seriously. 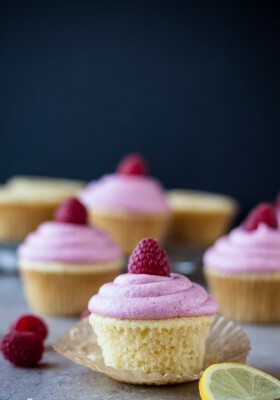 Can you believe that this is my first cupcake recipe on the blog? Total disgrace. I know. Especially since I spent almost a year baking and decorating them all day, every day, not all that long ago. So you can imagine the amount of pressure (read: a lot) I’ve put on myself over the years. The “first blog cupcake” that I would inevitably share with you guys had to be special. And different. Nothing too wacky, but definitely different. These cupcakes meet both requirements. Plus, they’re festive. So festive! Cue the carolers, light the Christmas tree, break out the Christmas mugs, quote Elf (“oh my god! Santa’s coming!? I know him! I know him!”) and listen to Carol of the Bells on repeat–that kind of festive, you know? First of all, there are the gingerbread cupcakes, which are full of dark molasses flavor, cinnamon, ginger, allspice, and cloves. They are tender, moist and incredibly simple to throw together. You could eat them as muffins, but that’s not nearly as fun. 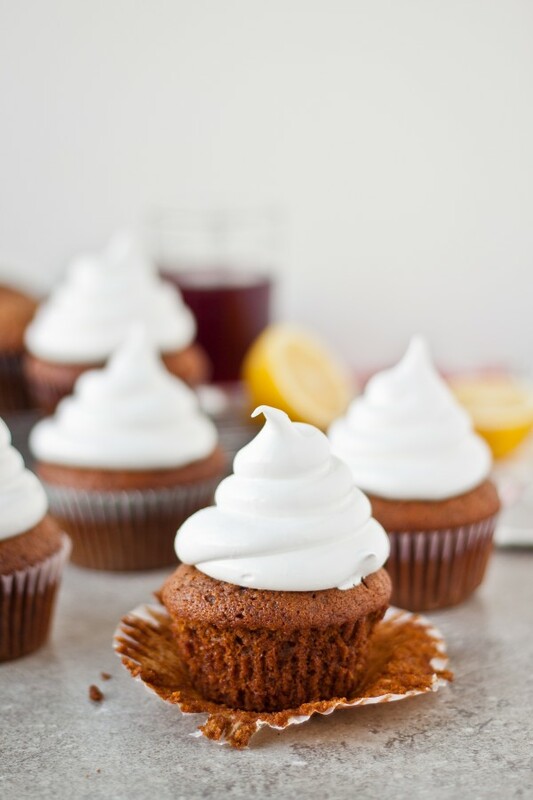 Once the cupcakes have baked and cooled, you top them with the world’s fluffiest marshmallow frosting–made from egg whites, sugar, lemon juice, and vanilla extract. It’s about three million times better than marshmallow fluff (which in my opinion, isn’t all that fluffy). In fact, it should really be called cloud frosting! So light and fluffy, I can hardly stand it. Then you drizzle each frosted cupcake with homemade pomegranate caramel! This part is mandatory, because this stuff is amazing and totally takes these cupcakes over the top. You know that step when you’re making normal caramel where you carefully whisk in cream and butter? Well, for this version, you’re going to skip the cream and add in pomegranate juice. And just a teensy bit of butter. Unlike regular caramel, this pomegranate caramel is a little sour and tart, with just the right amount of bitterness from the burnt sugar. It cuts the sweetness of the frosting perfectly and pairs so well with the gingerbread cake. It also has the prettiest red hue! These cupcakes were practically inhaled before my eyes. And loved by all. (Obligatory, half-bitten-into photo included below). Enjoy! Preheat the oven to 350 degrees Fahrenheit. Line a standard muffin tin with liners–and lightly grease with spray. 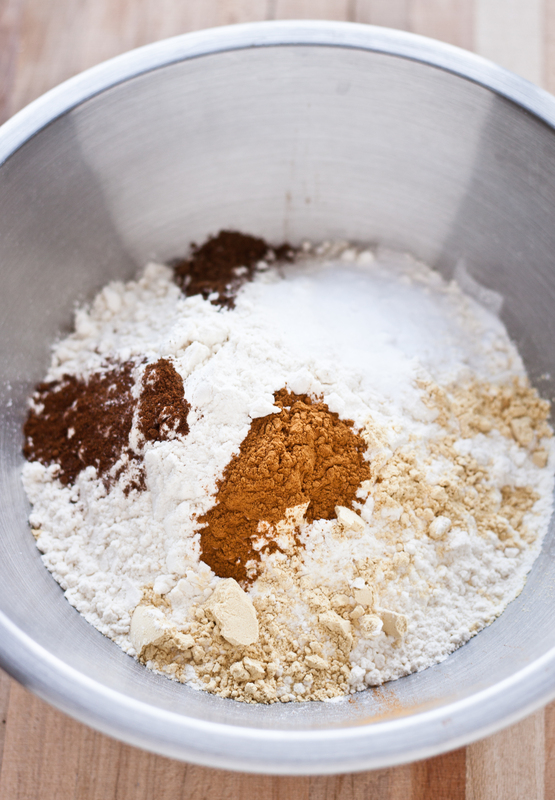 In a bowl, whisk together the flour, spices, salt, and baking soda. Set aside. In the bowl of stand mixer (fitted with a whisk attachment), whisk together the melted butter, oil, brown sugar, molasses, and egg. On low speed, add half of the water to the egg mixture, followed by half of the dry ingredients. Repeat with remaining water and flour mixture until just combined. Remove and scrape down the bowl with a spatula, ensuring that all ingredients have been incorporated evenly. 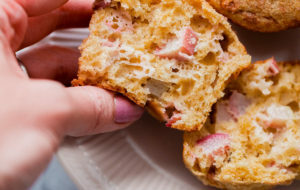 Divide evenly among a standard muffin tin, so that each is 3/4 full (it will most likely yield 11 cupcakes with this amount of batter in each cup). Bake for 20-22 minutes (rotating halfway), or until tops of cupcakes are just springy to touch and toothpick inserted in center comes out clean. Allow to cool in pan on rack for 3 minutes. Remove cupcakes and allow to cool on rack until completely cool. Combine sugar and water in a small saucepan (keep a small bowl of water with a brush nearby to brush away any sugar crystals that form on side of pan). Heat over medium-high heat, stirring until the sugar dissolves. Once sugar has dissolved, stop stirring and continue to cook until sugar reaches a medium-amber color. Carefully add the pomegranate juice, lemon juice, followed by the butter, and whisk together until mixture is well incorporated. 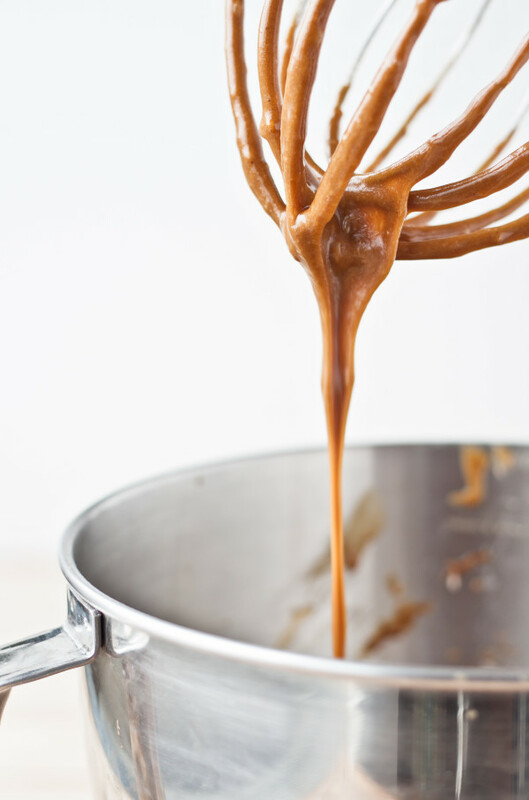 Continue to simmer over low heat, whisking occasionally, for another 3-4 minutes until caramel is slightly thickened. 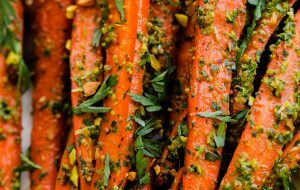 Set aside in a heatproof bowl and allow to cool to room temperature. Note: The caramel at this point will still seem relatively loose–but don’t worry, it will thicken considerably as it cools. 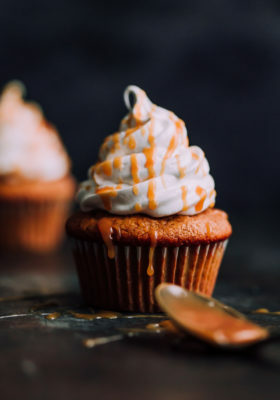 The caramel should be cool (but still drip freely from a spoon) for decorating–if it gets too thick, heat it in the microwave at 10 second intervals. Place egg whites, sugar, and lemon juice in (very clean) bowl of a stand mixer and place over a pot of lightly simmering water (double broiler). Using the whisk attachment, whisk constantly until sugar has dissolved and whites are lightly warm to touch (use your fingertips to test this–but it should take about 4-5 minutes, depending on how cold your egg whites are). Transfer bowl to stand mixer and beat over low speed for 1-2 minutes. Increase speed to high and continue to beat for another 5-6 minutes until frosting is thick, shiny, and stiff (will hold its peak). Add the vanilla extract and beat for another couple seconds until incorporated. Frost cooled cupcakes using your favorite tip (I used a 8PT round) and drizzle with pomegranate caramel. Serve immediately. Gingerbread recipe adapted from King Arthur; Marshmallow Frosting adapted from Martha. 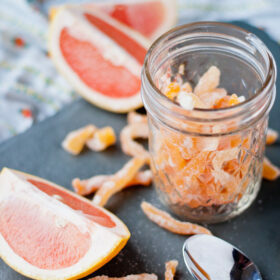 Looking for something to make with the leftover pomegranate juice from this recipe? Try this super easy pomegranate ginger sorbet. Wow! These look incredible! I’ve never heard of pom caramel before, and it’s definitely intriguing. Oh, and that FROSTING! OMG. I could faceplant into a bowl of that and be completely content. It’s so tart!! I just loved it. And yes, I totally agree Molly. I sort of wanted to use the frosting as a face mask. Or you know, sleep on mattress made of it. Normal things like that. when you say one of the best things ever, that’s a serious statement and my ears perked way up! gorgeous & pinned! I know! Very intimidating words to say, haha. Thank you so much Averie! These look and sound so delicious and so Christmassy – such a gorgeous recipe! Christmas-y should be added to the dictionary as an adjective. I have a feeling I’ll be using a lot more of it over the next few weeks. Thank you!! 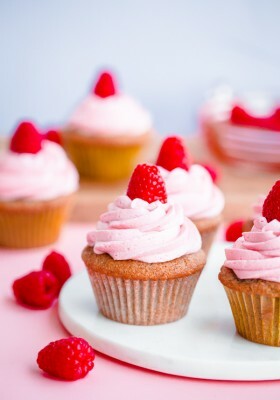 As a recovering cupcake fanatic — both baking and eating — I just know I’d adore these, but couldn’t be left alone with them. 🙂 I’m transitioning to gingerbread from my beloved pumpkin, and I think these would be a wonderful way to kick off the season! Excellent work! Haha! 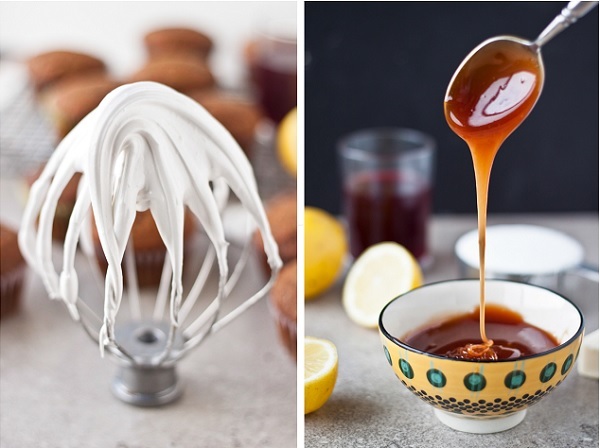 I’m a recovering cupcake baker–so I feel you on that. They are totally dangerous to have around–but when you think about it, the frosting is almost healthy (no butter!). Thank god I have a fiance that eats baked goods faster than me. He literally ate two within five minutes. Thanks so much Meg! I love a tall frosting!! Thank you so much Natalie! These cupcakes are just stunning. I can’t even imagine what pomegranate caramel tastes like, but I totally put it on my “to make” list! 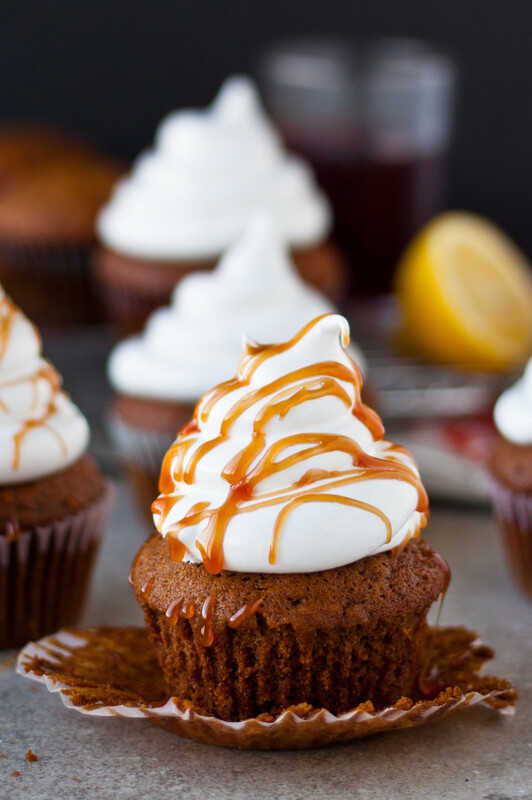 That pomegranate caramel sounds absolutely heavenly! Oh goodness, these are gorgeous! And pomegranate caramel???? Genius! Thank you, thank you! 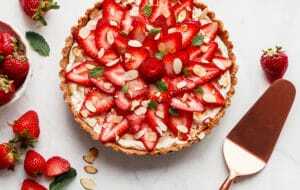 🙂 Loved your tart yesterday–still drooling over that one. Who was the taste tester for this recipe?! 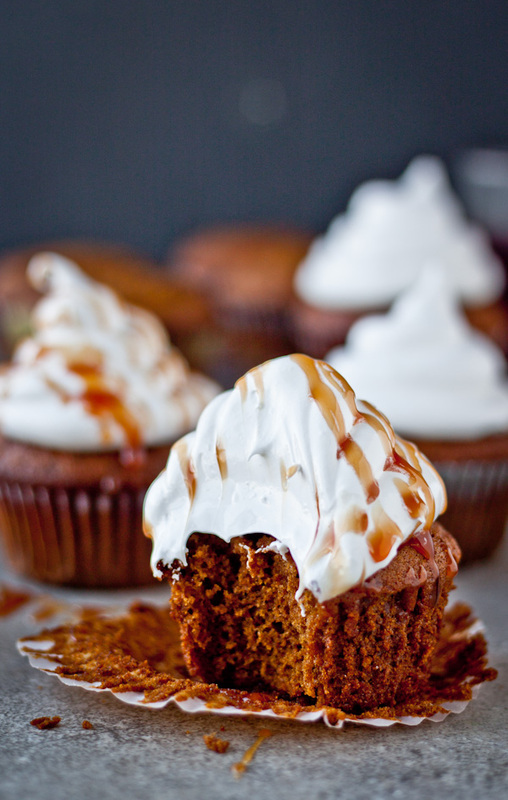 Gingerbread cupcakes and marshmallow frosting are always hits, but this pomegranate caramel really caught my attention. So clever! It definitely takes these cupcakes to the next level! Thank you so much Laura! These are the most festive dang cupcakes of all time! 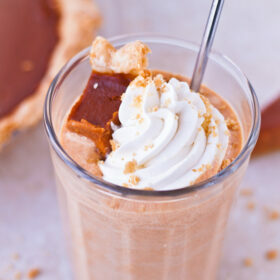 One of these and a hot chocolate and a little snowfall please! Aww, thanks so much Kathi! Can’t wait to do more of them–you know, now that I’ve gotten over the first “blog cupcake” hurdle. You had me at marshmallow frosting. And as if that wasn’t enough to go with my gingerbread addiction, the caramel drizzling on top knocked me! Definitely pinning :D.
You’re so sweet Jessica! Thank you so much. My gingerbread obsession this winter is out of control. These look gorgeous, and so festive! Yum!! 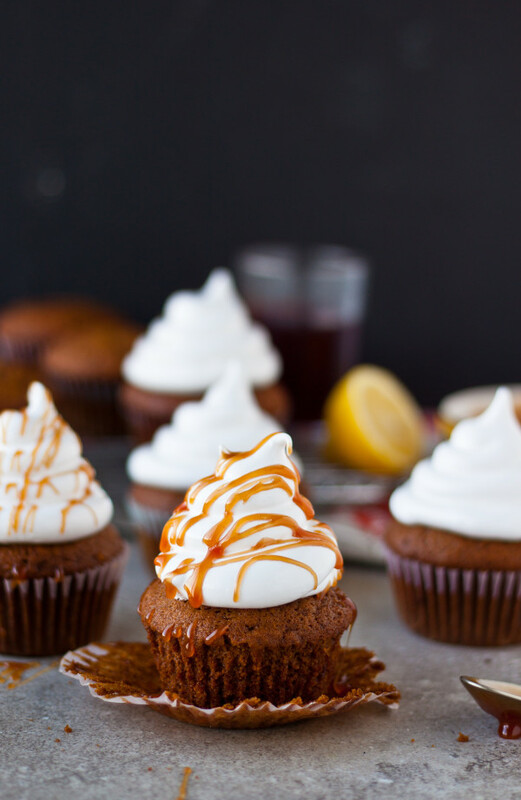 Wow, your gingerbread cupcakes look delicious. Could you please bottle up some of that pomegranate caramel and send me a huge shipment. I just have to try it out! Oh this is just beautiful and illegal!!! They are gorgeous, delicious and have a killer drizzle. I love your pomegranate caramel very much. Pinning!! 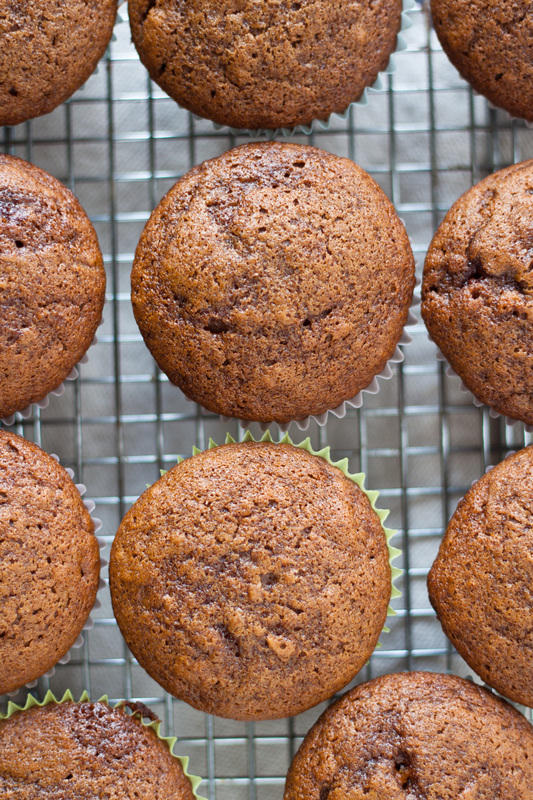 I’m making cupcakes for my niece right this moment, and how I wish I could use this recipe! I bet they’re one of the best things you ever baked, no doubt. And I’ll make it a point to have that pomegranate syrup in the fridge! Maybe eat it with a spoon?! Making these now. Can’t wait to try them!!! Did I overlook it, or is the brown sugar missing from the direction steps? I’m assuming it mixes in w/ the molasses, etc. Yikes!! You’re right, I missed it. Yes–you mix it in with the molasses, oil, butter, and egg in the first step. I am going to fix the recipe now. Thanks for catching that and definitely report back on the final result 🙂 Are you making the caramel too?! Wow. I made the cupcakes yesterday and I don’t think I’ve ever made such a tender cupcake in all my life. Today they are even better. This morning I set about making the rest of the recipe. The syrup is a.m.a.z.i.n.g. and I will be eating the whole bowlful myself (maybe a drizzle on the cupcakes). I’m thinking it will also make a gorgeous topping for Greek yogurt (after Christmas when we’ll all be “cutting down”). The marshmallow frosting unfortunately did not stiffen. What I think happened is that the egg whites were maybe larger than what you suggested. I got lazy and didn’t weigh them, and it was silly of me. Greek eggs tend to be bigger than US eggs I think. Anyhow, this is not a bad thing. I made a different frosting for the cupcakes and now I have another bowl full of thick marshmallow creme. It is going to be consumed with a spoon, while I watch tv later. I think it all worked out for the best 😉 Thank you for a beautiful recipe, and sorry for the lengthy comment! Yes!!!!! So thrilled to hear that you loved them as much as I did. Isn’t that syrup the best?! Totally want it on top of everything now. I would definitely try weighing the egg whites next time, if you think that your eggs are bigger than standard US ones. Or maybe add a touch of cream of tartar to help them stiffen. Also, the older the egg whites the better 🙂 Thank you again Eleni! The cupcakes were a big hit at the party! Everyone was impressed by how beautiful the reddish drizzle made them as well! I’m planning on giving some of the ones I left at home to my neighbors, but am really fighting the urge not to devour them all by myself!!! My neighbors better get home soon, is all I’m saying. This makes me so, so happy. Thank you so much for making them and reporting back! Your feedback totally made my day. Today I actually received Thank You notes for each of my daughters preschool teachers whom I took a couple in for. One of them also stopped me to tell me how delicious they were and said, “Do you know what my FAVORITE part was?!? The pomegranate drizzle! How did you make that?! 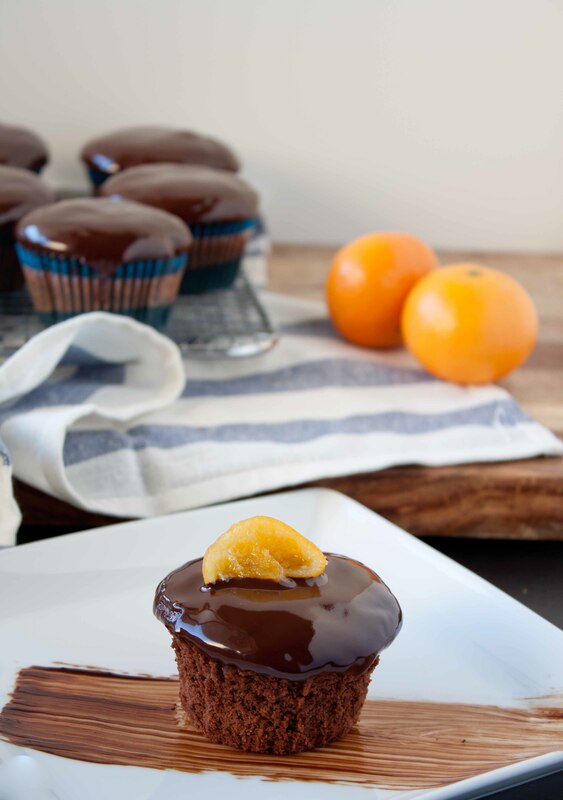 ?” Nothing but good reviews coming in for your cupcakes! So much so, that I am making them again today in a mini version for a party! Why not? Thanks again for sharing this recipe..looking forward to more from you in the future. Pingback: Busy Being Jennifer | 35 Gingerbread Recipes for the Holidays! OMG! How did I miss these?!? I need these in my lyyyyyyyyyyyyyyyyfe.